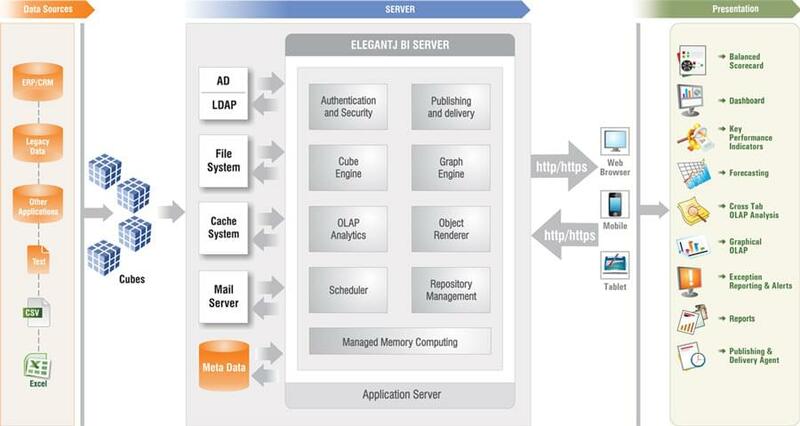 ElegantJ BI is a business intelligence and analytics vendor based in India, and has been providing managed memory computing and analytics software and services since 1996. Conceived and developed by Elegant MicroWeb, its first product was a Java development platform that allowed users to build Java applications without having to write a single line of code. Since then, ElegantJ has created a report builder, .pdf publisher, graph and charting tool, and a collection of Java beans for networking, database connectivity, graphing, etc. ElegantJ BI is a data federation platform that allows you to pick and choose your data sources. It uses in-memory processing to perform deep-dive analytics, allowing for complex analysis to answer business questions and provide proactive and reactive insights. The 100 percent browser-based tool allows for platform and OS-agnostic analytics, quick implementation, and low-cost, simple licensing. ElegantJ BI’s path-breaking, multidimensional KPI analytics can be used for simple monitoring of KPIs, or more complex analytical processing. The ElegantJ BI platform is suitable for any business, regardless of size or industry, and is flexible enough to meet a host of analytical requirements. ElegantJ BI customers include organizations like the World Bank, Cisco, HP, Honeywell, and many other tech and industry titans. Not sure if ElegantJ BI’s platform is right for you? Call and speak with one of our Technology Advisors today for a no-cost, no-obligation consultation. They’ll listen to your needs and help you decide on the best tool. Learn everything you need to know about ElegantJ BI. Our experts will reach out to you shortly.